When Oprah Winfrey ordered mosaics for her private villa in Miami last year, she chose Lebanon-based Mosaic Marble — and she must have been pleased as she placed an order for another project this year. The 260 different pieces of mosaic gracing the municipality of Rome are also the work of Mosaic Marble, a bid they won against an Italian counterpart. Offering more than 5,000 designs at starting prices of $330 per piece, the company is the leading mosaic producer in the Middle East. Generating $1.5 million in revenues last year, it also provides custom-made orders with the option to choose from over 100 different colors, marbles and stones sourced from Italy, Spain, Turkey, China, Lebanon and Syria. Their customization offer was put to the test by the order of Saudi Oger, the Hariri family’s construction company, for a 200-square-meter work made up of 16 different pieces, chief executive Taline Assi’s “most exciting order”. 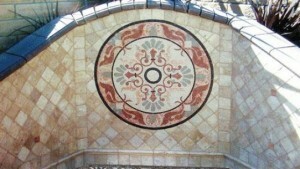 Set up in 2003 by Taline and her husband Antoine Assi, Mosaic Marble provides handmade mosaics sold through their website (available in 13 different languages), their showroom in Dora, several resellers scattered worldwide and eBay (where the company boasts of 3,687 positive and just one negative feedback mention). What is less rosy, though, is the location of their workshops, with 70 percent of the production conducted in Syria and the rest in Lebanon. “For the moment, we are not impacted,” says Assi, while also stating that the company is shifting the production from Syria to Lebanon next year partly because of the turmoil, but also for better quality control and in order to have the production in house and not outsourced; they are currently looking for a larger production facility in Lebanon. Carving a taller order Mosaic Marble is also looking to cater more to professional clients such as architects and construction companies of the likes of Saudi Oger, as they “are recurring and demand high-end products.” For now, most of the sales are driven by retail clients who acquire the mosaics for their private residences, with 60 percent of the orders coming from the US. With such a high exposure to the American market, the financial crisis took a heavy toll on the company’s sales: a 50 percent drop compelled Assi to look for new markets. She aims to target Middle Eastern markets, such as Saudi Arabia, Qatar and Kuwait, but also beyond the region, more specifically in Japan, Russia and Australia. “We are looking to become a worldwide leader in handcut marbles,” says Assi. The largest global mosaic players are currently Italian companies Sicis and Bisazza Mosaico, and the gap is huge; these companies have sales of approximately $250 million, according to Endeavor, a non-profit non-governmental organization that supports high-impact entrepreneurs in emerging markets and which has recently added Mosaic Marble to its network. With the current setup the company has the capacity to process up to $5 million dollars in sales, but the owners are not resting on their laurels. Mosaic Marble is looking to raise $1 million next year in a first phase of financing in order to set up a showroom in California in 2014, hire a salesperson to target professional clients in the Middle East and for other expenses. They will be seeking investment from a strategic investor who can add value, “give something back to the company and who could be involved,” says Assi. In the medium-to-long term, the company aims to eventually raise up to $3 million. For now, the company has a long to-do list, including moving production away from Syria, focusing on professional clients and whetting the appetite for mosaics in new markets — thus, just like making mosaics themselves, a beautiful business is built one carefully placed piece at a time.